75 SANSON, N. Amerique Septentrionale. Paris, Mariette, 1650. Beau col. ancien. Rousseurs, p�les mouillures, fente en bas du pli central (sans manque). Bordures et cartouches colori�s � l'�poque. - Paper slightly age toned, split in lower part centerfold, minor water staining and brown spotting. 390 x 553 mm. � 3e �tat. Carte de l' Am�rique Septentrionale grav�e par A. Peyrounin, avec les bordures et cartouches colori�s � l'�poque. - Third state. Map of North America with scale borders and title-cartouches brightly coloured at the time of publication. The map is engraved by Peyrounin. The North America is one of the most desirable seventeenth century maps and certainly one of the most influential for many years. It was the first map to show all five Great Lakes, which are open-ended to the west and the first to name Lake Superior and Lake Ontario. It's information on Indians in the Southwest was the most up to date at the time, especially for the Apache tribes, many of which are indicated here for the first time. California with flat northern coast sloping up to the east. The Azores are included, Lake Ontario is shaded. The colouring is uncommon, curious and very decorative. - McLaughlin, California,12, State 3 ; Wagner 360 ; Burden, North America, 294, state 3. 77 JEFFERYS, T. An Exact Chart of the River St. Laurence.. Quebec. Londres, Robert Sayer, 1775. Limites colori�es. Carte pli�e, imprim�e sur 2 feuilles jointes. Petites fentes aux extr�mit�s des plis dont une jusque sur 0,5 cm � l'int. de la carte. Petit trou � 2 intersections, 2 taches p�les au milieu. - Two sheets joined, 2 spots slightly brown in the center. In outline colours. 600 x 950 mm. � Grande carte illustrant l'estuaire de la rivi�re St. Laurent. Accompagn� de 5 cartons repr�sentant des trac�s de c�tes le long du Golfe homonyme. - With five insets. 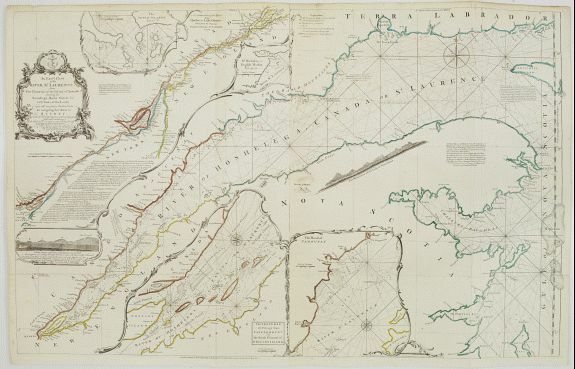 A chart of the St. Lawrence River by the noted eighteenth century English cartographer Thomas Jefferys, Geographer to George III and the Prince of Wales. Jefferys produced many important maps of America from 1751 until 1768, including this superior chart first issued in 1757. The main source for Jefferys was a map issued in 1702 based on a survey of the river by Jean Deshayes. 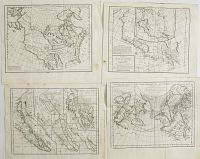 Deshayes map became the standard chart of the St. Lawrence until James Cook's surveys appeared in the second half of the century. Jefferys translated Deshayes' chart into English, and added an updated depiction of the river from Lake Ontario to Quebec based on J.B.B. D'Anville's 1755 map of Canada. This is a sailing chart, complete with soundings, rhumb lines for navigation, written directions, and coastal profiles. The central part of the map shows the river from Anticosti Island to Quebec, and it includes a number of insets such as the one based on D'Anville's map and four others depicting important sections of the river with greater detail. 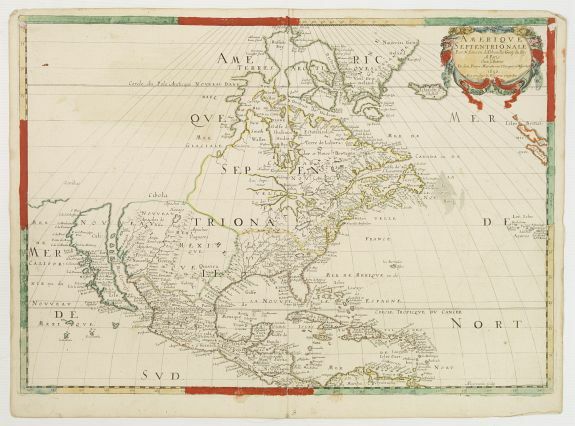 This reissue of the Jefferys map, which appeared in his "The American Atlas", was prompted by the growing tensions between the British government and its colonies, that generated an increasing demand for maps of North America. The St. Lawrence River, with its importance for shipping to and from the prosperous Canadian settlements, was of particular interest to readers in London and elsewhere in the English speaking world. 78 ADAMS, J. Map of the city and suburbs of Montreal. New York, 1825. Carte grav�e en 3 ff. non jointes mesurant au total : 80 x 186 cm. Doubl�e de papier du Japon, enti�rement restaur�e, manques de papier et d�chirures consolid�s avec certaines parties redessin�es, papier bruni par la colle. - Map engraved on 3 sheets not joined, if joined : 80 x 186 cm. Backed on Japan paper. Heavily restored with some loss of paper replaced and some parts re-drawn, paper browned. Sold as is..
� Monumental plan de Montr�al et de ses faubourgs par J. Adams, grav� par J. Deforrest Stout. John Adams arpenteur (actif 1819-1837) et James Deforrest Stout graveur (1783-1868). - Adams, John. Map of the city and suburbs of Montreal : exhibiting distinctly every property public and private, the course of the water works, the river line in front of the city and the La Chine Canal from its junction with the port.../ constructed from a new survey 1825 by John Adams, H.P. Royl Mily Surveyor and draftsman. 79 DIDEROT, D. Carte des parties Nord et Est de l'Asie.. (5 maps) / Nouvelle Repr�sentation des c�tes Nord et Est de l'Asie / Carte des nouvelles d�couvertes / Carte g�n�rale� de l'Amiral de Fonte / Carte� des Terres Arctiques / Partie de la carte du Capitaine Clun Paris, 1779. Traces de pliures, infimes rousseurs. - Some spotting. 301 x 383 mm. � Lot de 6 cartes publi�es dans l'"Encyclop�die" de Diderot. 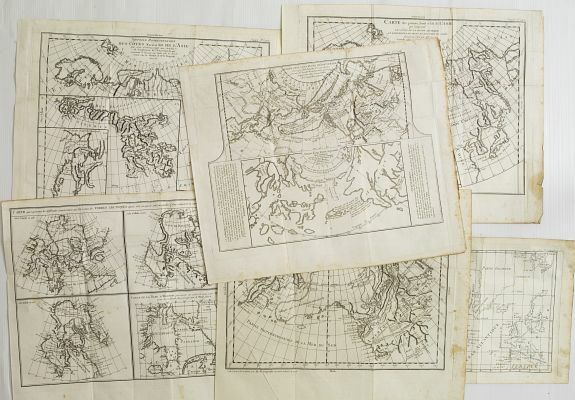 - The maps are from Diderot's "Encyclopedie" which contains ten maps of America, Asia and the Arctic Regions. 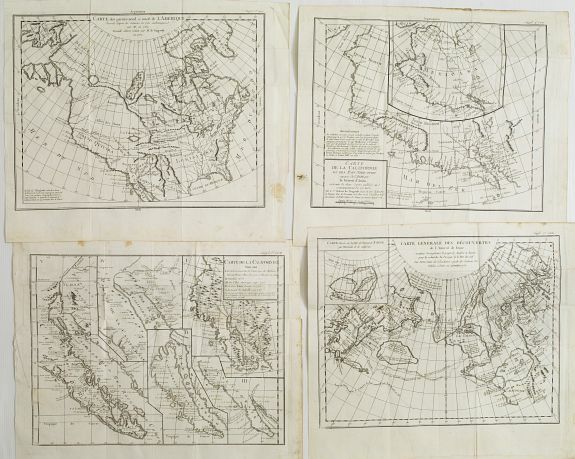 6 maps showing California, Canada, Alaska, Siberia and Japan. 80 DIDEROT, D. / VAUGONDY. Carte des parties Nord et Ouest de L'Am�rique Suppl. I.re carte / Carte de la Californie et des Pays Nord-Ouest Suppl. 4e carte / Carte de la Californie suivant� Suppl. 5e carte. / Carte G�n�rale des D�couvertes de l'Amiral de Fonte� Suppl. 7e carte Paris, 1772-1773. Infimes rousseurs, traces de pliures.. 295 x 370 mm.